Vorlon.js itself is a small web server you can run from your local machine, or install on a server for your team to access, that serves the Vorlon.js dashboard (your command center) and communicates with the remote devices. Installing the Vorlon.js client in your web site or app is as easy as adding a single script tag. It's also extensible, so devs can write plug-ins that add features to both the client and the dashboard, such as feature detection, logging, and exception tracking. You Mentioned Vorlon.js Has Plug-ins? Logging: The console tab will stream console messages from the client to the dashboard that you can use for debugging. Anything logged with console.log(), console.warn() or console.error() will appear in the dashboard. Like the F12 Dev Tool DOM explorer, you can see the DOM tree, select a node (which will be highlighted on the device, and update or add new CSS properties). Interactivity: You can also interact with the remote webpage by typing code into the input. Code entered will be evaluated in the context of the page. 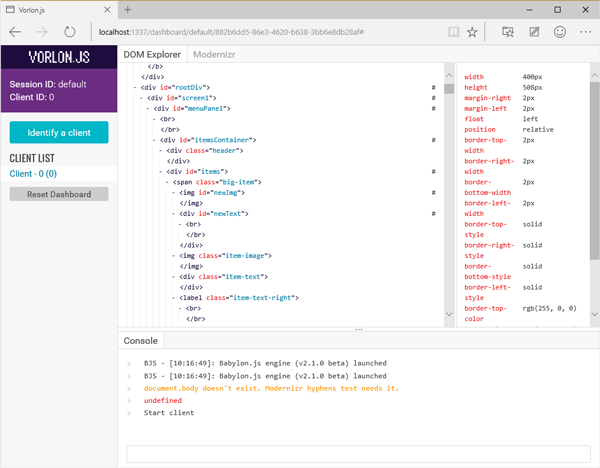 The DOM inspector shows you the DOM of the remote webpage. You can inspect the DOM, clicking on nodes to highlight them in the host webpage, and if you select one you can also view and modify its CSS properties. The Modernizr tab will show you the supported browser features as reported by Modernizr. You can use this to determine what features are actually available. This might be particularly useful on unusual mobile devices, or things like games consoles. Now you have a server running on your localhost on port 1337. To get access to the dashboard, just navigate to http://localhost:1337/dashboard/SESSIONID, where SESSIONID is the id for the current dashboard session. This can be any string you want. Please note that SESSIONID can be omitted and in this case, it will be automatically replaced by "default". And that's it! Now your client will send debug information to your dashboard seamlessly. Let's now have a look at an example using a real site. 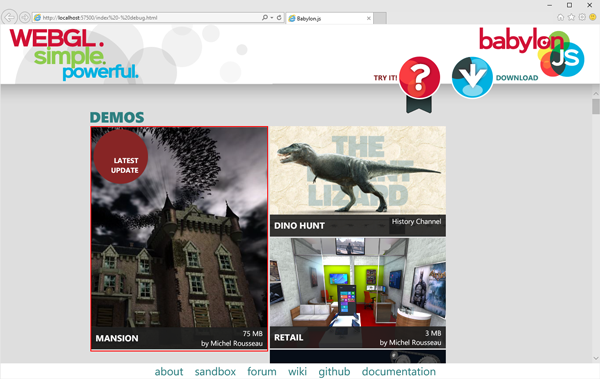 Sidenote: The browser shown above is Microsoft Edge (formerly known as Project Spartan), Microsoft's new browser for Windows 10. You can also test your web apps for it remotely on your Mac, iOS, Android, or Windows device @ http://dev.modern.ie/. Or try Vorlon.js too. On the left side, you can see the list of currently connected clients and you can use the Identify a client button to display a number on every connected device. From the very beginning, we wanted to be sure that Vorlon.js remains as mobile-first and platform-agnostic as possible. So we decided to use open source tech that worked across the broader number of environments. A Node.js server is hosting a dashboard page (served using Express) and a service. 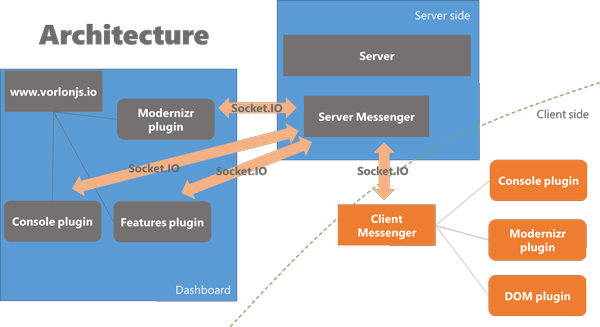 The service is using Socket.IO to establish a direct connection with both the dashboard and the various devices. Devices have to reference a simple Vorlon.js page served by the server. It contains all the plugins' client code which interacts with the client device and communicates with the dashboard through the server. The client side generates a hook on top of console.log(), console.warn() or console.error(). This hook is used to send the parameters of these functions to the dashboard. It can also receive orders from the dashboard side that it will evaluate. The dashboard side gathers these parameters and displays them on the dashboard. You can get an even better understanding of Vorlon.js extensibility, including how to build your own plug-ins, at the Vorlon.js website. Vorlon.js is built on the idea of extensibility. We encourage you to contribute! And we're already thinking about how we might integrate Vorlon.js into browser dev tools as well as Web Audio debugging. If you want to try it, you are just one click away: vorlonjs.com. And the more technical docs are on our GitHub.